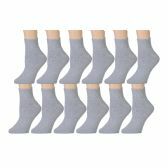 12 Units of Yacht & Smith Mens Cotton Ankle Socks, Low Cut Athletic Socks - Mens Ankle Sock at low wholesale prices. alltimetrading.com offers Mens Ankle Sock at bulk discounted prices. These socks feature a mesh top for breathability and additional comfort. Allows airflow into your socks. This unique design was developed for athletes who also want to look stylish. Choose from high quality performance socks for men. BREATHABLE SPORTS SOCKS: These breathable sports socks are great when worn with sneakers. Whether you’re jogging, running, going to the gym, exercising, or playing sports, these socks are comfortable for all day wear. Play basketball, tennis, softball, and more. ATHLETIC SOCKS: Quarter length socks offers you the additional mobility by allowing you to move around without having to worry about your sock slipping off. It also allows for your legs and feet to stay cooler when in heat. MOISTURE WICKING, ARCH SUPPORT, RHT TECHNOLOGY: Features RHT technology which includes the reinforced heel and toe which prolongs the life of the socks. Designed to provide arch support and providing comfort even through intensive activities. Wicks moisture away keeping your feet dry. Made with 71% cotton, 17% spandex, 9% polyester, and 2% elastane for a stretchy and premium softness. Size 10-13 will fit men’s shoe sizes 8-13. YACHT&SMITH is committed to bringing you the latest and trendiest socks and accessories. Not only do we have the most fashionable styles, we offer you the medium between price and quality. If you are for any reason not satisfied with your purchase, please reach out! SKU: 1287427 Free same day shipping. SKU: 2022177 Free same day shipping. SKU: 1950297 Free same day shipping. SKU: 1953177 Free same day shipping. SKU: 496195 Free same day shipping.